An original hand-tinted picture taken from an advertising flyer that was sent to dozens of local councils, including Brighton and Hove. A smidgen over a hundred years ago in April 1917 the country’s last electrobus started on its final journey from Hove to Brighton. It passed the elegant Victorian edifice of Hove Town Hall and trundled along Western Road into Brighton before disgorging its very last passenger in Castle Square, at the bottom of North Street. 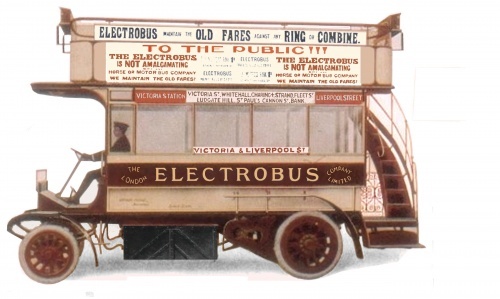 The electrobus was the world’s first practical electric bus, a bus powered by batteries alone, unlike the later trolleybuses, which drew their power from overhead wires. Brighton and London were the only two places to have electrobuses. In the years before the First World War the electrobus was cutting-edge technology. It was quiet, clean and very reliable. The electric buses were a complete contrast to the petrol vehicles, which were beginning to replace horsepower, but were widely reviled for their deafening din and noxious fumes. To many observers the electrobus was the future of transport. “The doom of the petrol-driven omnibus is at hand,” forecast the Daily News, after the electrobus’s London debut. Today the electric vehicle is once again being touted as the future of transport – as a way of fighting air pollution and climate change. Brighton’s Big Lemon bus company now runs the 52 route with electric buses and the government has just given the company a grant of £500,000 to buy more electric buses. So why did the first generation of electric buses fail? The explanation in the history books is that the electrobuses were slow and their range was limited, a bit like milk floats, because of their heavy lead-acid batteries. But the history books are wrong. The failure of the electrobus had nothing to do with its technology. In London the electrobuses were actually slightly quicker than today’s buses. And the engineers had come up with an innovative way of getting round the problem of limited range. At the end of the morning shift engineers swapped the exhausted batteries for freshly charged ones at a lightning lunchtime pitstop. Within minutes the electrobuses were back on the road, ready for the afternoon shift. 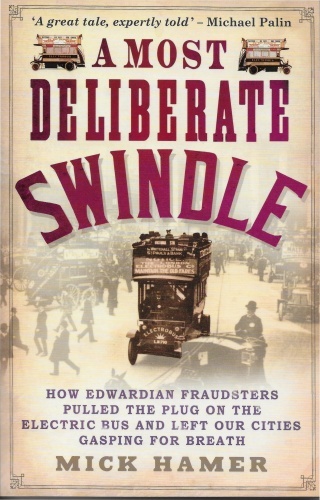 The real story, as revealed in A Most Deliberate Swindle, is that a gang of swindlers systematically siphoned off nearly all the money that shareholders had invested in the London electrobus enterprise. It wasn’t just Edwardian shareholders who lost their nest eggs. Over a century later, the consequences of this swindle are still with us as cities choke on the exhausts of the internal combustion engine. Today Brighton’s old electrobus route is a pollution hotspot. It has illegally high levels of the nitrogen dioxide, a gaseous pollutant that causes respiratory problems. Diesel buses are the chief source of this pollution in North Street and Western Road. Brighton’s first electrobus arrived in style from London on Easter Sunday in 1908. It swooped down into the town to the accompaniment of a posthorn, to be greeted by a throng of journalists who had just finished a lavish lunch at the Hotel Metropole. It had much of the flavour of a modern motor car launch. There was a strong contingent of newspapermen from London and one local reporter was moved to comment in some awe on the glamour and glitz of it all. Brighton’s interest in electric buses was prompted by mounting protests over petrol vehicles. Brighton already had a network of new electric trams, which were fume-free and relatively quiet, but Hove was vehemently opposed to trams, with their working-class associations. The genteel residents of Hove may have hated trams, but they just loathed petrol buses. In November 1907 more than 500 people signed a petition to Hove Borough Council protesting about the noise and smell of petrol buses. The next month Brighton received a similar petition complaining about the ‘dangerous speed, enormous weight, unbearable noise, unpleasant smells’ of motor buses in Western Road. The two councils were at loggerheads over trams but they could at least agree that electrobuses were superior to petrol buses. The residents also strongly supported electric vehicles. In October 1908 John Flynn, the canon of St John’s at Palmeira Square, asked the council to insist that only electrobuses could run past his church during Sunday services – because the noisy petrol buses were drowning out his sermons. But the company did not have enough electric buses. Under pressure from both councils to do more about noise the local bus company, the Brighton, Hove and Preston United, leased a plot of land in Montague Place from the council to build a garage and charging station so that it could expand its fleet of electric buses. The garage is still there. It was made a listed building in 2015 because of its historical significance. At the beginning of January 1910 the electrobus service in London collapsed after just two and half years. The swindlers had taken the money and run. Brighton bought eight of the second-hand London electrobuses and unwittingly became yet another victim of the rip-off. The swindlers had paid a nominal £800 for these buses. They sold them to Brighton for £3,411 – a mark-up of 325 per cent. The transaction brought Brighton’s fleet of battery-electric buses up to 12. Now that the London operation had ceased, Brighton and Hove had the world’s largest fleet of electric buses, a figure that wouldn’t be surpassed until the 1990s. Over the years the Brighton electrobuses proved to be very popular among the travelling public and very reliable. They lasted ten years, most petrol buses didn’t last half that long. In May 1917 the absence of electrobuses prompted Brighton council to ask what had happened to them. The bus company, now owned by a countrywide group called Thomas Tilling, said that a lack of spares meant they could no longer run the electrobuses. 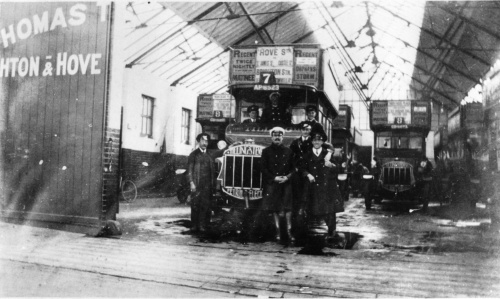 A photograph of the garage in Montague Place garage in the 1920s. These are not electrobuses. Photo kindly supplied by Step Back in Time in Queens Road.